Dr William Wan shares his bucket-list and quite a few items he has already checked off including skydiving and scuba diving! 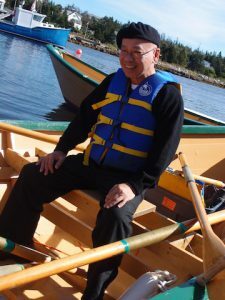 Dr William Wan in a deep rowboat called a Dory. He shared he had borrowed it from a friend and rowed it out from a cove in Nova Scotia to the mouth of the Atlantic Ocean. He spent half a day rowing it, and found it strenuous and fun. Why did you have a bucket-list? I have a bucket-list because I am thankful for the gift of life. As I age, I stop taking every day for granted. It is easy to take the precious gift of being alive for granted in the humdrum routines of life. So it is good to get out and “live” it – to feel the joy of being alive. To live it for me includes experiencing how others live it – it is to feel it – feel the silence of the atmosphere as you float down from 10,000 ft in skydiving, or feel the pressure of water around you as you scuba dive or the cold wind blowing into your face as you dog-sled. A bucket-list to me is not about seeing but for doing, for feeling. What on your bucket-list have you done so far? For me, my bucket-list is not hugely difficult. They are just stuff that I have always wanted to do for the experience but didn’t have the time to do. They have to be a little challenging, but not too time-consuming either to do it or to train for. 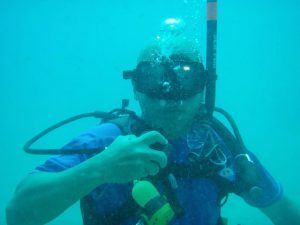 I started at age 61 to do my bucket-list and so far I have accomplished – skydiving; snipe-racing; scuba diving; rock-climbing; hot-ballooning; visiting a medieval village up a mountain in the Caucasus; entering a medieval defence post and imagining what it was like to be under attack; glacier-hiking in Iceland; dog-sled riding in Greenland; getting close to an iceberg, feeling the enormity of it and thinking of how it sank the Titanic; driving through a desert; riding a camel on the sand dunes of the Gobi; etc. Any item that you have done on your list that you would want to do a second time around? I have no desire to repeat any of them, as there are still so much more to do and experience. Enough for me that I have been there and done that, and it is time to move on. Can you share two of the things you have done and your experiences doing it? 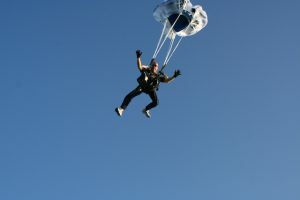 Skydiving made me feel the great vastness of the open air. Though I was free-falling for a minute at a certain speed, I did not feel I was falling at all because there was no reference point. The cold silence was most palpable. It was a humbling experience to realise how little I was in the vast nothingness in the sky. The dog-sled experience reminded me of the toughness of the human spirit before the advent of motorised snowmobiles. Just to be out there for two hours in the freezing cold in the afternoon was already very challenging for me – imagine the Eskimos having to travel that way from place to place every day and night. Just the thought of how tough it was and how tough they are to endure it was very instructive for me and not to take modern amenities for granted. What are some things you still have to go through? Better to try than not to try. The thought of trying for Base Camp of Mt Everest is probably not realistic because of the time and resources needed to train. Bungee jumping is a possibility but need to ascertain the safeness. The idea that it is better to try than not to try must also be balanced by the reality of the time I have and the resources to train, etc. Another item he can check off – skydiving. How do you plan to achieve your bucket-list – one item each year? I do not plan too far ahead as each new day is a bonus – a wonderful gift from God. Whenever an opportunity arises and I can make time for it, I will consider doing an item on my bucket-list. How often do you add to the list? The list is self-added so it is not an existing pre-decided list. There is no priority other than when there are more than one opportunities and given limited time and resources, I may have to pick just one for that year. And if so, it will be decided simply on what is most doable in comparison. I have some ideas of course – stuff I have not yet done in places I have not yet been. Actually, I have already travelled to a great number of countries before I turned 61 and had done wind-surfing quite a bit in Canada, been to an underground salt mine in Europe, floated on the Dead Sea in Israel, drove a truck across parts of Northern India, etc, way back when I was younger. So now I just live and do what I am doing with passion and zest, and whatever comes up or suggested to me, I will consider and do them if I feel like doing them. There is no need to plan so hard. Any advice to those who are interested in doing their bucket-list? There are many different ways to consider the bucket-list – if you think of it as a list of things you want to do before you “kick the bucket” then it can be as simple as anything you want to do. Some people list learning a new language, visiting a new country and/or doing random acts of kindness every day. 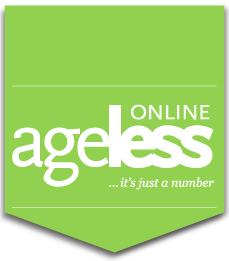 The point is it differs from person to person, depending on personal interests, physical fitness, financial resources, etc. My advice is don’t just dream about it – go and get it done!